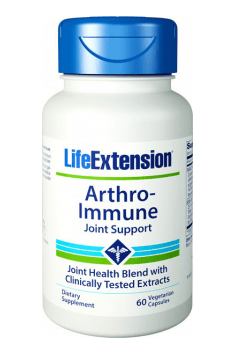 Life Extension Arthro-Immune Joint Support is a dietary supplement which combines two plant extracts (PARACTIN® and BCM-95® Bio-Curcumin®) and forms a one powerful formula. Their safety and effectiveness have been clinically proven. The supplement aims at maximum mitigation of joints inflammatory states and reduction of autoimmune reactions. PARACTIN® is a proprietary Andrographis paniculata extract (the standardized content of andrographolides – 30%), which has proved its efficiency in mitigation of joints inflammatory states in clinical studies. BCM-95® Bio-Curcumin® is a high-quality extract from turmeric corms (Curcuma longa) in proportion of 25:1; the standardized content of curcuminoids – 95%, with necessary essential oils which show high biological activity. The proprietary extract is seven times better absorbed than commonly available on the market dietary supplements. RA, rheumatoid arthritis, is a disorder characterized by chronic inflammatory lesions of connective tissue, usually it is an autoimmune disease. The condition leads to joints destructions and their impaired functions. Eventually, it could cause progressive disability. RA is a one of the most common systemic diseases. The disease affects women three times more frequently than men. The morbidity peak falls in 35–50 year of life. Moreover, the RA prevalence increases with age. The causes of RA have not been fully understood yet. The disease progression may be influenced by several factors – acquired immunological response disorder (where the T lymphocytes play a very important role, as they identify the body system antigens), past infections (especially viral infections) and genetic factors. The under described Life Extension ingredients have proved their efficiency in clinical researches as substances which support the treatment of RA and other joints inflammatory diseases. Andrographis paniculata (Green chirayta or India echinacea) – a healing plant, also known as green chiretta or Indian chiretta. It is commonly used in Ayurvedic and traditional Chinese medicine as an antimicrobial, antifungal and antiviral (among other – against HIV), cytotoxic, immunosuppressive, antipyretic, anti-inflammatory, antiparasitic, diastolic, analgesic, hepatoprotective and detoxing agent. It contains numerous biologically active ingredients, such as andrographolides (14-deoxyandrographolide, 14-deoxy-11,12-didehydro-andrographolide, neoandrographolide, isoandrographolide, bisandrographolide, andrographis) and flavonoids (methoxyflavones). The clinical studies1 (randomized placebo-controlled double blind treatment) which were carried out in 2008 should have evaluated the effectiveness of Paractin® extract from Andrographis paniculata (standardized for the 30% content of andrographolides) in mitigation of RA symptoms. The studies lasted 14 weeks. As it has been demonstrated, the patients reported a decline in the intensity of joint pain, stiffness and swelling. Moreover, rheumatoid factors such as IgA antibodies and complement components C4 were reduced. The results suggest that Andrographis paniculata may probably be used in the treatment of RA and joints inflammatory states. Curcuma (Curcuma longa; turmeric) – a perennial plant which comes from India. It contains numerous biologically active substances, such as curcuminoids (curcumin, demethoxycurcumin and bisdemethoxycurcumin) and volatile oils (including turmerone, bisabolol, zingiberene, atlantone, xanthorrhizol and curcumene). Curcumin (diferuloylmethane) is a major component of curcuma and it is responsible for its yellow color. It shows different biological properties: it influences transcription factors, growth factors, receptors, cytokines and numerous enzymes, including kinases. Ample studies have proved its anti-inflammatory and anti-oxidant properties. It is commonly known that chronic inflammatory states lead to development of numerous diseases, including rheumatoid arthritis (RA). The central mediator of inflammation development is the complex of transcription factor NF-kB. Curcumin inhibits NF-kB activation, which suppresses the development of inflammatory states, oncogenesis, metastasis and many other inflammatory diseases. One of the clinical studies2 has proved the efficiency and the safety of curcuma extract in the treatment of degenerative knees symptoms. A comparative study has been carried out. One group has been receiving Ibuprofen (an anti-inflammatory agent from the NSAIDs group) in a dose of 800 mg daily, while the other group – a curcuma extract in a dose of 7 grams daily for 6 weeks. As it has been demonstrated in the above mentioned study, the curcuma extract was no worse than Ibuprofen – it reduced inflammatory states and pain. This all makes it a potential agent in the treatment of arthrosis, including RA. In another study3, patients with arthrosis have been receiving curcumin in a dose of 400 mg three times a day for 2 weeks. The inflammations have significantly decline and the general condition of movement apparatus have been improved. To sum it all up, Life Extension Arthro-Immune Joint Support is a dietary supplement which contains only effective clinically attested ingredients. It is recommended for inflammatory states reduction, improvement of movement apparatus functions and as a support in the treatment of joints diseases (only under doctor's control). 1 R. A. Burgos & J. L. Hancke & J. C. Bertoglio & V. Aguirre & S. Arriagada & M. Calvo & D. D. Cáceres, Efficacy of an Andrographis paniculata composition for the relief of rheumatoid arthritis symptoms: a prospective randomized placebo-controlled trial, Clinical Rheumatology 2009. 2 V. Kuptniratsaikul, S. Thanakhumtorn, P. Chinswangwatanakul, L. Wattanamongkonsil, V. Thamlikitkul. Efficacy and Safety of Curcuma domestica Extracts in Patients with Knee Osteoarthritis, J Altern Complement Med. 2009 Aug;15(8):891-7. 3 Deodhar SD, Sethi R, Srimal RC. Preliminary study on antirheumatic activity of curcumin (diferoyl methane) Indian J Med Res 1980; 71:632-4. Arthro-Immune Joint Support 60 caps. 1 capsule 1-2 times a day during a meal, with a 6-8 hour interval. Or ask the doctor. In the case of mild inflammation of the joints take 1 capsule per day to reduce it. More severe and moderate inflammation require 2 capsules daily. In the case of rheumatoid arthritis, to achieve the best results, supplementation 2 capsules per day for 14 weeks. vegetable cellulose (capsule), micro-crystalline cellulose, silica, stearic acid. Strong stimulation and maximum concentration without the feeling of anxiety. Stimulant and nootropic in one.